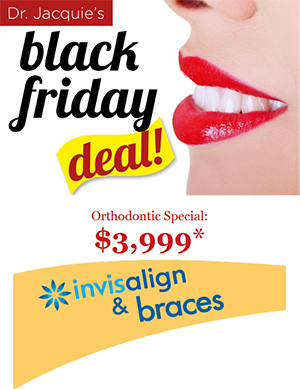 Dr. Jacquie Smiles Black Friday Orthodontic Special. Invisalign or Braces. Only $3,999! *This offer is for 12 months of orthodontic treatment. Does not include surgical or extraction cases. Treatment must be paid in full to receive the special pricing and can be used for Invisalign or Braces. This promotion cannot be combined with any other offer and is for new patients only.